Amid with his sister-in-law Rosalie on one of their visits to the PSHF office. “Mama, please remember that even when I’m gone, just think of me and I'll be by your side.” These were the last significant words of Amid a few days before he died on September 24th. Amid Fernando who would have turned 21 on October 7th. He was the seventh son of Merlinda Fernando, a widower from the countryside village of Narra in Ma-ao, about 40 kilometres southeast of Bacolod city where the PSHF office is located. He died from complications arising from his illness, aplastic anaemia which was diagnosed eight years ago. Merlinda Fernando (59) who is Amid’s mother, said that Amid had waited for his brother Jobert before breathing his last. 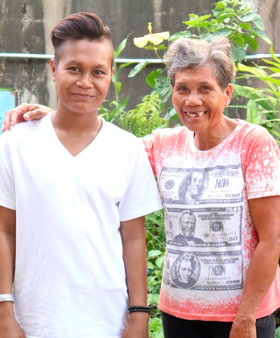 When Jobert got to the hospital in the morning of September 24th, Amid asked for a woven palm mat from him as he found the hospital bed too hot. Immediately Joseph bought a mat as well as a chamber pot because Amid was too weak to get up to go to the toilet. There were four of them at the isolation ward of the public hospital that evening: Amid with his two older brothers, Joseph and Jobert, and their mother Merlinda. After sitting on his bed for sometime, Amid asked his brother Joseph to lay him down on his bed because he was getting tired. Soon after he lied down, he struggled to breathe. Seeing this, Merlinda hugged Amid tightly while saying: Amid, my son, I love you so dearly; but she felt that he was slipping away. Shortly after his eyes and mouth closed. It was around 7 pm. Rosalie (Amid’s sister-in-law; she is Jobert’s wife) who used to go with Amid in his trips to the hospital took a leave of absence from her job in Cebu in order to be with him. She told us that many people would likely come to Amid’s funeral on Sunday, September 30th. Amid was well-loved and well-known in his village.